A story that is not often told about the weekend of Nelson Mandela's release from prison is the one about the desperate quest to find his wife the night before he was freed. When then president FW de Klerk caught everyone by surprise by announcing Mandela's release on the Saturday, there was a scramble to get the leadership of the Mass Democratic Movement to Cape Town as soon as possible. Funds were quickly sourced to charter a flight to the Cape so that everyone would be on the ground to do enough planning to make Madiba's release on the Sunday the kind of dignified and historic affair that it should be. Winnie Mandela, as she was then known, was nowhere to be found. Teams of comrades scoured Johannesburg into the early hours of the morning in search of the Mother of the Nation. When she was eventually found, she was in a not-so-nice location, in not-so-good company and in a not-so-good state of mind. Even when the aeroplane arrived in Cape Town, she was still in need of some good rest so that, by the time she got to Victor Verster Prison, Mandela would be able to recognise his spouse and be excited to see her. This obviously necessitated a delay in when she could be taken to him and, by extension, when he could eventually walk out of those gates. And so the old man twiddled his thumbs, unaware that the frolics of the person he loved were delaying his freedom. There are many who were involved with the logistics of that historic day who are still angry with her for being partially responsible for the delay in Mandela getting his first taste of freedom. They will tell you that, even if it was a delay of a few hours, every minute must have felt like ages if you had been inside a prison's walls for 27 years. They knew this behaviour by Winnie Mandela was not out of character. It was just that, on that day, it had disastrous consequences. This story is not often told because this not a pleasant narrative. When it comes to Winnie Madikizela-Mandela, you can either tell the story of a saint or the story of a villain – it is never the story of the complete person. And so a story such as this one, the story of the coarse Madikizela-Mandela, is not a welcome one. Let's start with those who saw her as a villain because they are easily dismissible. To this lot, the only frame into which Madikizela-Mandela fitted was the Moeketsi "Stompie" Seipei kidnapping, the infidelities, the incendiary rhetoric and the alleged abuse of finances. To them, she would have been a demon even if she performed a miracle that made a blind man see. Just as problematic is the legion of Madikizela-Mandela cultists who refuse to accept that she was a deeply flawed human being; that she was a problematic figure in resistance politics and in post-1994 democratic politics. In honouring Madikizela-Mandela, we should not overlook the blemishes on her being. Doing so would be denying our own history and how, in many ways, she reflected some of the worst flaws of our damaged society and the ugliness of our bitter history. Madikizela-Mandela must be praised for emerging from the shadow of her more prominent and powerful husband. At the Rivonia Trial in the early 1960s, while the cameras and commentary focused on her beauty and glamour, Madikizela-Mandela was projecting an image of courage and indefatigability. She became the spokesperson for the revolution that the apartheid system was trying to crush. In subsequent years – with the leaders of the anti-apartheid movement either in exile or in prison – she was to emerge as the primary voice of the anti-apartheid forces. To the student and scholar movements of the late 60s and 70s, she was a pillar of strength. She did not succumb to harassment, imprisonment and torture – she just got stronger and more defiant. This is why the apartheid government was forced to banish her to the remote Free State town of Brandfort, a fate as terrible as prison or exile. And that is where things seem to have gone horribly wrong. It was this period that seems to have irreversibly turned her into the wayward individual she became, a waywardness that many are so dangerously in denial about. It is a common human trait to refuse to acknowledge the deficiencies of our leaders and heroes. Last week, we saw a deluge of tributes that sought to present her as an amalgamation of Queen Nzinga, Mother Theresa, Cleopatra and Nandi. This week, the worship will multiply. Dare we forget that, in 1989, the leadership of the Mass Democratic Movement publicly distanced itself from the so-called Mother of the Nation because of the "reign of terror" that she and her Mandela United Football Club were conducting in Soweto. The football club, which was nothing more than her private vigilante gang and whose only association with soccer was its kit, had terrorised the township and was almost as feared as the Jackrollers gang. Such was the extent of grievance against Madikizela-Mandela and her thugs that members of the Congress of SA Students even attempted to burn down the Mandela house. After numerous attempts to rein her in and put a stop to conduct that undermined the struggle, the leaders had to act. Accusing her of abusing the trust and confidence of the people, and falling into "conflict with various sections of the oppressed people and with the Mass Democratic Movement as a whole", the leaders said her practices had "violated the spirit and ethics" of the movement. Madikizela-Mandela's excommunication by the anti-apartheid movement did not come at the whim of an individual or individuals who despised her. An instruction had already come from the ANC headquarters in Lusaka – on the authority of no less a person than Oliver Tambo – that her criminal gang should be disbanded. But because Madikizela-Mandela was, in her view, above the ANC and the internal liberation movement, this instruction was ignored. This unruly streak had frightened many in liberation circles since Madikizela-Mandela's return from Brandfort. Some celebrated this as a rebellion against patriarchy and chauvinism, but it was in fact ungovernability of the highest order. At the height of the necklacing phenomenon – which she encouraged with her matchboxes and tyres speech – she had defied instructions from Lusaka to withdraw her endorsement of the cruel punishment that was meted out to suspected traitors. Madikizela-Mandela was her own movement. While other leaders worked within structures and subjected themselves to such inconveniences as attending meetings and being given duties to perform, Madikizela-Mandela preferred being the star act who headlined rallies and marches. The everyday mundanity of organisational work was beneath her. 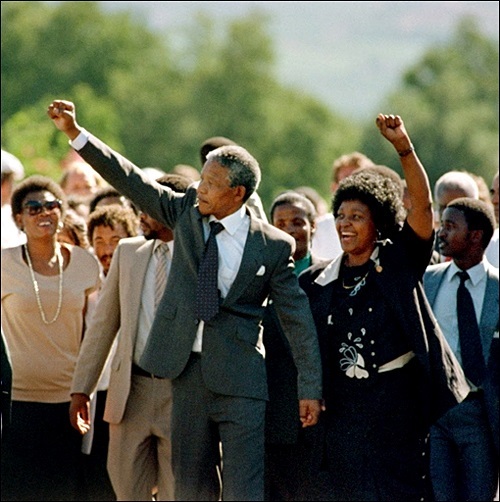 Mandela's release in 1990 rescued the errant Winnie from exile. She was back in play. In 1991, she earned the most votes to become part of the national executive committee of the unbanned ANC at its first conference in Durban. At a time when Nelson Mandela and other senior leaders were navigating the rugged road to a negotiated settlement, Madikizela-Mandela was one of the discordant voices in the leadership, and she played to the militant gallery. Paradoxically, this proved fortuitous because the apartheid regime was waging a vicious fight against communities with death squads and surrogate militias. Radical voices were needed to keep the spirit of resistance and hope alive. Knowing the person she was, the internal and external leaders were united on one thing – limiting her power. In 1991, they succeeded in blocking her from becoming president of the ANC Women's League, a position that would have given her power that was somewhat independent from the mother body. They tried again in 1993, but they failed dismally. She was again returned to the position in 1997 – against the wishes of the inner clique. That same year, a great effort was made to halt her bid for the deputy presidency of the ANC at the party's conference in Mafikeng (now Mahikeng) in North West. So determined were the party grandees to prevent her from taking the number two position that they were even prepared to stomach the rise of Jacob Zuma, whose corruption and uselessness had already been evident in exile and in the KwaZulu-Natal government, where he was serving as an MEC for economic development. Those sympathetic to her say these efforts were motivated by the fear of her feminist sway and the inability of men to tolerate a strong woman. Nothing could be further from the truth. The life and legacy of Winnie Madikizela-Mandela will be debated for decades to come. She will be canonised by most and demonised by a fringe minority. She will be credited with single-handedly keeping the flame of freedom alive in the darkest days of apartheid repression. Her courage and resilience will be spoken of in high decibels. She will be labelled as the most outstanding and the most upstanding among us. The biggest mistake we will make is that we will try to understand her in black and white, as either the object of our affections or a figure of hate. We should neither see her as a villain nor a saint. She was just an ordinary human being whose heart was hardened by suffering and whose soul was numbed by torture. We should not elevate her to the status of a role model who we should emulate, as many have been doing since her death. None of us should want to be Winnie Madikizela-Mandela. If we aim to be contributors to a better nation, we should not try to be the damaged goods that came back from Brandfort. If we want to be good leaders in our respective spaces – be it in a stokvel, corporation, political party or sports club – we should possess the humility that she so lacked. And if we want to make a genuine impact on society, we should avoid the temptation of the glory-seeking that defined her. By all means, let us thank her for the tremendous sacrifices she made, along with her generation of struggle leaders. But at no point should any of us want to be her replica. - Makhanya is editor-in-chief of City Press.